Have your next event catered by Nacho Daddy or book your event in one of our private dining rooms. Delivery options are available. Send catering inquiries to Catering@nachodaddy.com or use the form below. 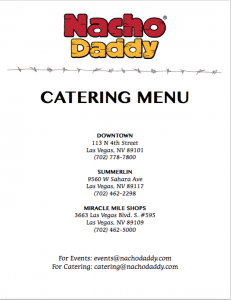 E-mail events@nachodaddy.com to book your next event in one of our Private Dining Rooms.